When master coach Alexei Mishin first watched Evgeni Plushenko skate a decade ago, images from an old Russian fairy tale played through his mind. As Mishin mentally evaluated the raw talent of the skinny 11-year-old boy from Volgograd, Mishin couldn't stop thinking about a fabled gold fish. "At that time, I did not know he would be World champion," Mishin said. "I just knew he was something outstanding, like a gold fish. It's from a fairy tale about a man who is fishing and hooks a gold fish. "The fish says, 'Give me freedom and I will grant you three wishes.' I understood that I had something like a gold fish on my line," Mishin explained. He also understood that the freedom he must provide the young Plushenko was not freedom in the usual sense, but freedom from financial hardship. Without that, Mishin feared, Plushenko's incredible promise would go unfulfilled. As the reigning and two-time World champion prepares to defend his Grand Prix Final title this week in Colorado Springs - where the winner earns $35,000 - it is difficult to imagine that not so many years ago, Plushenko existed on little more than love and talent. After his hometown rink closed, the preteen Plushenko and his mother made the 1,000-mile move to St. Petersburg and coach Mishin. They arrived without enough money for even the bare necessities of life - safe, clean shelter and nutritious food. "It was extremely hard," Mishin recalled. "The financial problems nearly killed them. [For] some time he lived in my apartment, and my relatives brought him food. He and his mother had to have a stone heart to survive. "After this period, they rented a very simple room in an apartment. There was no shower and the building was infested with rats, but they survived," added Mishin, who finally decided he would pay the rent so mother and son could live in a better place. Despite having taken Plushenko under his wing, Mishin says theirs is not a father-son relationship. "The coach should be an older brother, the person with more experience in life and more knowledge in the sport, but not like father and son because that cannot be productive," he advised. "He is like a father to me," Plushenko said. "When I came to St. Petersburg I was only 11, and he helped me a lot - not just in the ice rink. We went to the symphony, museum, cinema, restaurants, played soccer, went swimming, went everywhere. We're more than friends." In 1997, Plushenko, then 14, won the World Junior title. The following seasons at the World Championships, the young upstart claimed bronze, then silver. By the time Plushenko won gold in 2001, 15 years had passed since he first took up the sport against his father's wishes. My father is happy now. He's changed his mind," added Plushenko, who, unlike many fellow Russian figure skaters, has resisted the urge to relocate to the United States to train. "In Russia we have everything we need. There is ice. What more do I need?" he asks. Now 21, Plushenko has not had to worry about money since bursting onto the scene and international podiums in the 1998 Olympic season. The Grand Prix and ISU Championship prize purses, combined with performance fees from the Champions on Ice tour, have seen to that. He owns a Mercedes and a motorcycle, and driving them is one of his favorite pastimes. Recently, Plushenko bought a new house in St. Petersburg for himself and his parents, Viktor and Tatiana. An American bull dog - appropriately named Golden - two Yorkshire terriers, and cat Liyly (which is a Russian term of endearment) are also part of the close-knit family. "I like to spend money on my family, to buy them what they want, because they helped me all the time, did everything for me, gave me what I needed," said Plushenko, who also bought an apartment for his older sister and her young daughter. But, what Plushenko needs now - freedom from injury - is not something money can buy. This season, he has been hobbled by a torn meniscus in his right knee, forcing him to scale back training time and compete with caution. During the 2002 Olympic season, he struggled with foot, knee and groin injuries, which required he temper his training in order to even reach Salt Lake City. In Utah, Mishin mused, "Some people think of Evgeni and the Olympic silver medal like it is a disease. The silver is not shame." Since the start of the 2002-03 season, Plushenko has been invincible, finishing atop ISU Grand Prix, European and World podiums. He posted three Grand Prix victories this season and, despite the knee problem, intends to soldier on into 2004 to defend his European and World crowns. Surgery to repair the damaged joint is slated to follow. Like most elite skaters, Plushenko's fan mail includes invitations from young women to meet them at restaurants and discos. Given that he now has a girlfriend - a young woman with whom he struck up a conversation one day on a St. Petersburg street - he continues to decline unsolicited proposals. On the ice, Plushenko relishes the idea of raising the technical bar. He hopes to be the first to land a quadruple Lutz in competition, although that is not likely to happen this season. "I just need to be healthy," said the man credited with performing the first quad-triple-triple jump combination. "Sometimes I wake up in the morning and I feel a problem with my back. I wake up like old people. Sometimes, it's my knee, like I need more warming up or something." 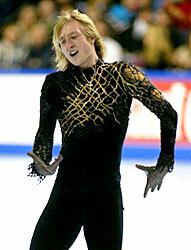 Body willing, Plushenko intends to skate for Olympic gold again at the 2006 Winter Games in Torino, Italy. "That's my dream. That's everything for me," he said, noting that even competing at the 2010 Games in Vancouver, Canada, where he won his first World title, is a possibility. "That's my life. I want to skate. I want to compete with the top sportsmen," he said. This week in Colorado, Canada's Jeff Buttle and Michael Weiss of the U.S. are among the sportsmen aiming to halt Plushenko's winning streak. The gold fish will not be easily caught.